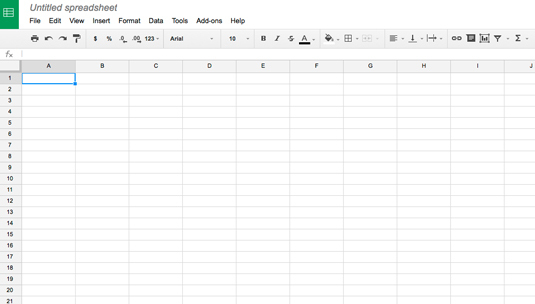 Google Sheets is the free spreadsheet functionality built into Google Drive. Think Microsoft Excel with basic spreadsheet functions, such as formatting columns and rows, inserting formulas and charts, filtering and creating pivot tables, and so on. Keep in mind, though, that Google Sheets offers only basic spreadsheet functionality. If you need more advanced features, such as macros and financial analysis tools, you’ll need to invest in a program like Microsoft Excel. Google Sheets is a web-based application, which means you don’t have to install the software on your computer. You can use it on different devices, so for example, if you start a budget report at work in Google Sheets, you can finish it up later at home or on your tablet because the application and the document are stored on Google Drive. No files to transfer. To start a new document, click the red New button in the upper left. Choose Google Sheets. A new browser window or tab appears displaying a blank Google sheet (see Figure 1). To open an existing document, navigate to the document you wish to open on your Google Drive and double-click. The document appears in a new browser window or tab. Figure 1: A blank Google Sheets document. You can also open Microsoft Excel spreadsheets in Google Sheets. Just upload an Excel spreadsheet to your Google Drive and double-click it. You can view, print, or share the spreadsheet. However, if you want to edit the spreadsheet, you have to open it in Google Sheets by clicking the Open button at the top of the Excel viewer. The spreadsheet is converted and saved as a separate Google sheet that you can edit. You don’t have to manually save your spreadsheet. Google Drive automatically saves it for you. To create a new document, tap the green circle with the plus sign at the bottom right. A new document appears on your screen. To open an existing document, navigate to the document you want to open on your Google Drive and tap it. The document opens for you to edit. Right now, you can’t really do a whole lot with the Google Sheets app. You can format text and cells or insert rows into your spreadsheet, but you can’t insert charts or use many of the other advanced functions of the web-based application. But the app is still handy if you need to view a budget report during a meeting or make quick updates and have the spreadsheet saved automatically to your Google Drive.